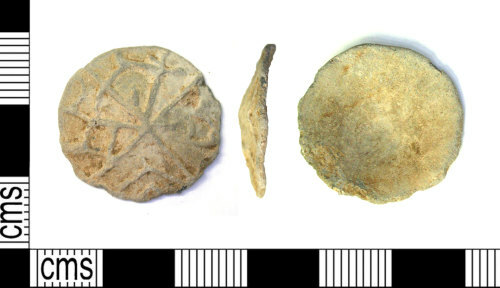 Medieval to post medieval lead alloy token. 22mm in diameter, 4mm thick with a weight of 4.14grams. The object is circular in form and sub-semi-circular in cross section. It is slightly domed and hollow and is decorated with a thin raised cross dividing it into quarters, with each one being filled with slightly different decoration, two have irregular crosses, one has a chevron and one a rectangle? The form is unusual, but the decoration implies a token.